The multiple frequency approach of the Virginia Packet Network should provide coverage of the entire state via NVIS at least for some of the time. However, there is just no getting around the benefit of spatially diverse VHF+ ports to provide better coverage for users. As nice as renting space on towers may well be, the western mountains of Virginia provide quite amazing coverage of the Piedmont. Very few sites exist that can accommodate VAPN gear and all of them serve other purposes. It doesn’t hurt to ask though. The next figures of propagation analysis best portray the reward for our success, if success comes. Figure 1 shows the 6m coverage from the Fauquier county location. 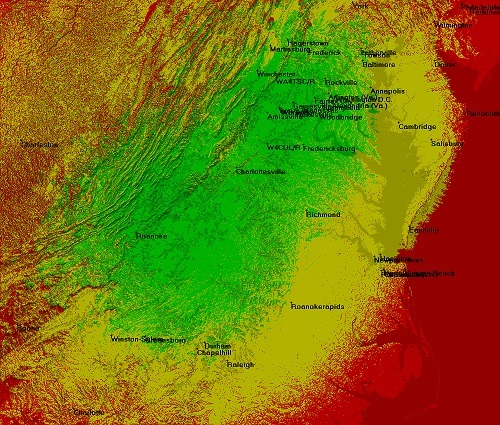 Figure 2 shows the 6m coverage from Fauquier plus one additional site near Roanoke Virginia. 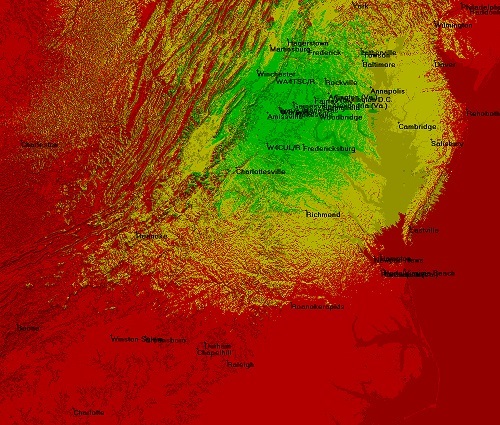 The relationship to Virginia’s borders isn’t very clear in these propagation maps, sorry, but you can get a sense by spotting the eastern shore upper right, OBX lower right, Roanoke mid-left, etc. Actual 6m coverage will, of course, depend on a great may things, but the above figures directly compare one vs. two sites while changing no other parameters. This is a reasonable A-B comparison. The old timers will spot trouble with this concept right away. If we have two systems at play, some way of transferring information between them necessitates some sort of data interconnection. At least two schemes exist to move data between packet nodes: Internet (telnet) and good ole RF packet forwarding. Internet (telnet) – This often uses the 44.0.0.0/8 AMPRNet addresses to “telnet” data back and forth between nodes. Yes this works, but uses the insecure and obsolete telnet approach for negotiation and transfer and is, hence, prone to savage attacks. RF Forwarding – In its heyday, this technique moved lots of data around the country and, I suppose, the world through very slow links. This feature is also one drawback of AX.25 as RF links notoriously stomp on each other reducing throughput. Forwarding between just VAPN nodes, and only VAPN nodes, might be a practical balance. Up until now the VAPN has been a system un-reliant on external connections outside the RF ports so adding any intra-node connectivity will entail caution. Perhaps a VPN approach that enshrouds the telnet inside an encrypted Internet link will fit the bill. We have this running now as a remote secure maintenance avenue to the machine hosting the node. It’s crystal clear adding geographically spaced nodes does wonders for service area. We need to keep the spacing between nodes far enough apart to prevent users from stomping each other. However the nodes need to be within RF range of each other for true Internetless functionality. These are conflicting requirements. With some care, a balance might be practical. The rewards are great enough to continue the study.